Synopsis: A man who runs an apartment house for women is the demented son of a Nazi surgeon who has the house equipped with secret passageways, hidden rooms and torture and murder devices. Karl Gunther’s house is a bit like Dr Who’s Tardis in that its limited confines contain endless miles of oversized ventilation ductwork through which he can comfortably shuffle in order to spy on his pretty female tenants. This network of ducts is so extensive that he actually has a little trolley in there so that he can wheel himself along to save wear and tear on the elbows of his cardigan. 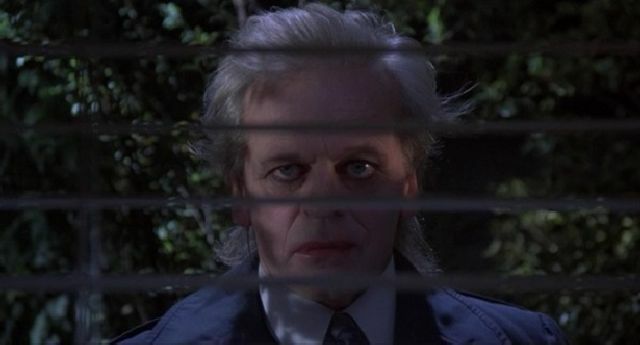 He’s a bit of a queer duck, that’s for sure, which makes the casting of legendarily bonkers actor Klaus Kinski something of a master-stroke. 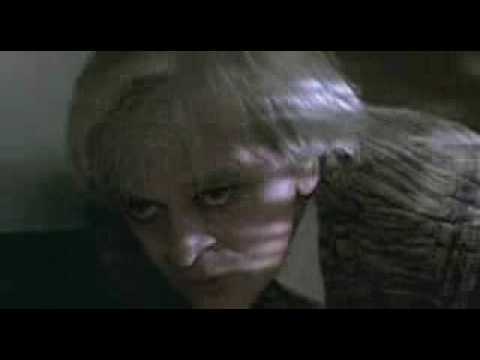 Kinski was not only psychologically suited to the role, he could also do creepy with ease. In Crawlspace he simpers and speaks softly in a vaguely effeminate way which is a little reminiscent of Peter Lorre. One thing’s for sure — no single young female would even come close to renting a room from this guy in the real world, no matter how difficult lodgings were to come by. Crawlspace takes the unusual step of telling its story largely from the viewpoint of its killer. In fact we learn a lot more about him than we do about Lori Bancroft (Talia Balsam), his latest tenant. He’s the progeny of a Nazi doctor, and has inherited his father’s urge to kill. He sort of justifies his acts by playing Russian Roulette with a gun loaded with a single bullet — which literally has his name on it — softly proclaiming ‘so be it’ after surviving each turn, as if believing that by allowing him to survive, fate is somehow condoning the atrocities he commits. He likes to invent quirky gadgets of murder (pre-dating Saw by a good 20 years), and he keeps a mute young woman in a cage in his attic. He keeps the tongue he cut from her mouth in a glass jar, and refuses to allow her to die because if he did he’d have no-one to talk to. The film opens with the previous tenant of Lori’s room straying into Gunther’s attic and finding herself fatally skewered through the chest — presumably as punishment for being such a wooden actress. Gunther wastes no time advertising her flat for rent, telling any male callers that it’s no longer available until a suitable female enquires. Once moved in, it’s not long before Lori is unsettled by a strange clicking sound which Gunther passes off as rats in the vents but which is actually him tapping a penknife against a steel ball as he spies on her and her fellow female lodgers. He also has the habit of luring unwary visitors to his attic by doing the same thing. Apparently the sound of metal clicking on metal is irresistible to all, no matter how creepy the situation. These visitors invariably find themselves dead with one of their body parts residing in a jar next to Mutey’s tongue. Strangely, few of these murders are actually shown on-screen. In fact, Crawlspace is strangely coy in that respect, preferring to dwell more on the nature of Gunther’s madness than its physical manifestation. We see the build-up and the consequence, but rarely the act. Although one noticeable exception sees a troublesome visitor triggering a razor sharp blade into his posterior when he accidentally presses a hidden switch on the arm of the chair in which he’s seated. You can just imagine the kind of faces that poor chap pulls. Because of this apparent squeamishness, the movie rarely succeeds in generating the sort of tension you’d expect to find in a movie of this kind. Even Lori seems to be only mildly concerned as Gunther pursues her in the final reel. Crawlspace is a Charles Band production, which means it was made on the cheap. The lack of budget shows in the small number of actors employed and the limited locations. There are no exterior shots at all, and the movie takes place in this kind of bubble in which the outside world rarely intrudes. Certainly Gunther gives no thought to the matter of how he’ll dispose of his victims or whether anyone in the outside world will report them missing to the police. If you can get over this, and the mediocre acting from all but Kinski, then the German actor’s typically quirky performance might just be enough to get you through this otherwise tedious movie.